Although the announcement of the spilt between Jennifer Lopez and Marc Anthony was accompanied this week by the well crafted lie that the couple had “come to an amicable conclusion on all matters,” the truth is at odds with the statement. In fact the decision to split actually came “after months of nonstop arguing,” says a source close to the family. 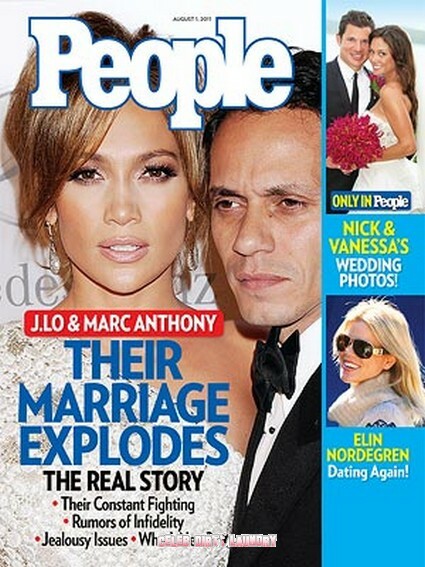 There were issues of power and control on a movie set, Marc’s envy of JLo’s ‘American Idol’ role, but the biggest problem was that Lopez was convinced of Anthony’s infidelity. Friends for years, Lopez and Anthony dated briefly in the 1990s. They stepped out again as a couple in early 2004, shortly after Ben Affleck broke his engagement to Lopez, and also in the midst of Anthony’s divorce from first wife, former Miss Universe Dayanara Torres. They eventually wed at a quiet home wedding in June 2004. Lopez who dated Sean Combs in addition to Affleck, had been married twice before – to restaurateur Ojani Noa (they split up in 1998) and former backup dancer Cris Judd, to whom she was married from 2001 to 2003. Please, tell it to someone who believes it – people who love, admire and respect each other very much don’t get divorced – they do what’s necessary to fix their problems and stay together.